Beginning in 1700 the monks of the hospice began breeding the famous dogs named after their patron saint to assist in winter rescues. 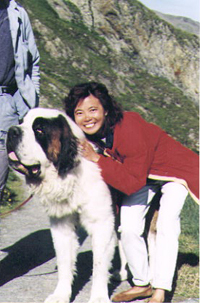 They were avalanche dogs, trained to nose out straying or buried wayfarers. These dogs are the symbol of devotion and willingness, the faithful companion of the canons. Today, they winter in Martigny and with the return of more clement weather, they return to the Pass during summer.